Hyde community Action is running activities locally to bring women of different cultures together. We have has immersed ourselves in events to help bridge the gap between the different religions and ways of life in Tameside. 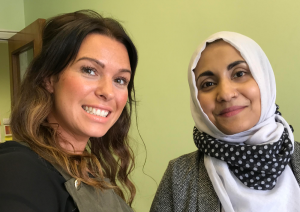 At the end of Ramadan Hyde Community Action staff and volunteers hosted a workshop at Tameside Women’s Centre in Ashton about the Islamic holy month and the celebration at the end, Eid ul Fitr. This first workshop was a triumph and a small step towards building a more integrated neighbourhood. Hyde Community Action’s Ruhela spoke to the group about the Islamic traditions surrounding the holy month of Ramadan and one of the major celebrations of the Islamic calendar at the end of it. The ladies attending had the opportunity to ask lots of questions, which was a real eye-opener for some. The feedback following the event was wonderful and there was a real sense of having taken positive steps towards a kinder and more tolerant world. Answers to the questions dispelled some myths and went a long way towards breaking down barriers. Many of the questions centred around the hijab (head scarf) and the why, what, and when – and some were surprised to hear, that many Muslim women take it off at home, that it can be any colour and that it is related to different Muslim schools of thought, whether you wear a hijab or a niqab (full face veil). The atmosphere on the day was very upbeat, and everyone made a real effort to find common ground. Everyone in the room agreed that the media has a big part to play in the growing xenophobia and that this makes living in a multicultural society more difficult than it needs to be. In stark contrast to the negativity conjured up by the media, the ladies enjoyed themselves getting into the activities organised by Hyde Community Action. One of our Trustees, Liza, showed the ladies how to put on a hijab and Volunteers Salma and Farzana decorated many of the women’s hands with beautiful patterns in henna. As with many of our events, the highlight of the day was once again food. Some of our volunteers had been busy cooking dishes from their native Bangladesh which, as always, went down a storm. More events are planned for the coming months, all with the aim of bringing communities closer together and raising awareness to continue to build strong ties in the local community.